Sustainability eMagazine: Population is a killer for Global Warming. Good news, Kinda. Population is a killer for Global Warming. Good news, Kinda. 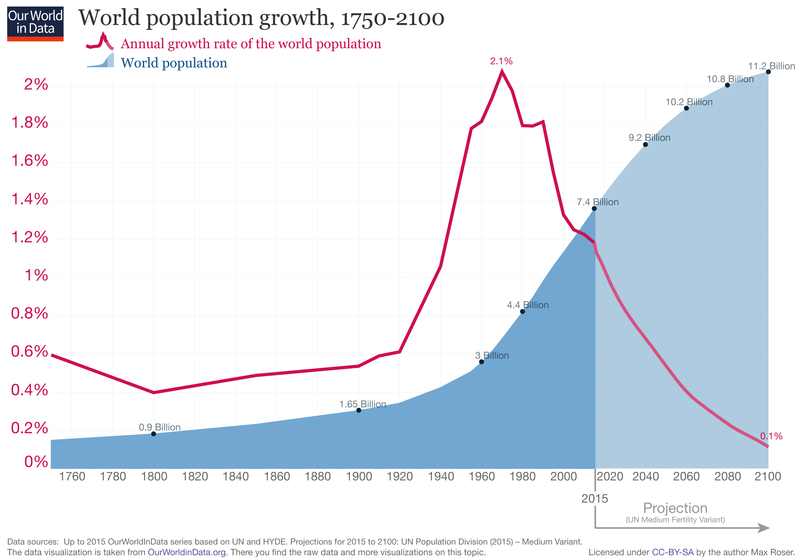 The world's out of control human population growth is something that few people want to talk about loudly because it sounds so very insensitive. 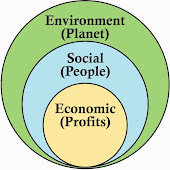 But the increase in world population at nearly exponential levels is non-sustainable and multiplies all issues of sustainability: exhausting natural resources, pollution, etc. Estimates are that world population will grow to between 9m and 11m by mid century and then slowly decline. The problem with increased population is a double whammy. Not only are there more people, but the footprint of each person should raise dramatically as more people enter the middle class (or higher). Countries like China and India that have burned only 2 barrels of oil per person annually, can be expected to move up their consumption to 4 or 5 times that, more in line with the USA. People that eat lower on the food chain, rice and corn, can be expect to start eating beef and pork which takes 20 to 30 times the resources to produce. The low fertility rates in developed countries means that their populations should start shrinking (without net immigration). In 1950 women had an average of 4.7 children in their lifetimes, a rate that is now half at 2.4! Fertility rates less than about 2.1 result in a decrease in population (excluding net immigration). Many of the developed countries, like the UK with 1.7, have less than 2. Japan has 1.3. With fewer young people to work, the aging retired population becomes a bigger and bigger burden on the economy. It will take decades for the change in fertility to work through the population levels. China and India represent about 35.7% of the worlds population with 1.4B and 1.34B, respectively. China has stomped on the brakes for decades; India has only tapped on the brakes. China's growth rate is only 0.39, while India's is 1.2. US is 0.71 and Japan is -0.23. So, a big sustainability question, is first to stop the increase in population world-wide and regionally. But should sustainability initiative actually champion the reduction of world population. One way or another we need to get back to the carrying capacity of Mother Earth. When you look at Earth over-shoot day, which has moved to August 1, it becomes graphically clear how much we are depleting the earths resources to live beyond our means. Stated differently, about 212 days into the year, we exhausted the renewable resources provided by the earth (and sun), so the resources consumed in the remaining 153 days of the year are depleting resources. In 1987, overshoot day was December 19th; in 2000, overshoot day was November 1. This is the same as your annual salary paying all your bills until August 1 (58% of the year), and then you have to borrow money to pay for the rest of the year. Each and every year, you have to borrow more because the overshoot day keeps moving earlier in the year. Non-sustainable issues like overshoot are cumulative, and compounding. Not only do you owe the cumulative total of all the borrowing, but the interest keeps growing at an expanding rate using the magic of compounding. We need to get our overshoots (and deficits) under control, and start to make the magic of compounding work for us, not against. Getting countries (and world) population growth under control is probably the most important factor in sustainability, and ultimately, the health and wellness of our plant. It's pretty important, as well, for those things that have become accustomed to living on this planet. !